Hamsters are funny little creatures that delight us with their adorable and downright quirky behaviors. One of these behaviors is the way that they stuff their cheeks full of food for seemingly no reason at all. So, what is the reason for cramming their little faces with pieces of food? We’ve done our research to tell you exactly why hamsters do this. In the wild, hamsters will store food in their cheek pouches until they’ve returned to the safety of their nesting area. 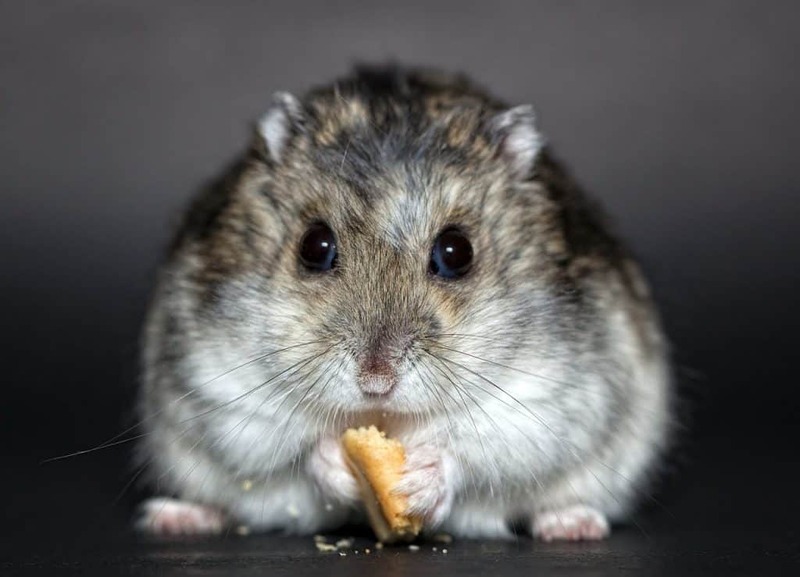 Because hamsters are vulnerable to opportunistic predators in the wild, it is typically unsafe for them to pause and have a meal out in the open. They store their food until it can be relocated to where he or she knows it is safe. If your domestic hamster is doing this, don’t worry about it! This is a natural and healthy behavior that poses no threat to their well-being. It also doesn’t mean that your hamster feels unsafe in their habitat. This is just a natural inclination that hamsters have. Continue reading if you want to learn more about this aspect of hammy behavior, as well as things that you, as an owner, should be on the lookout for. What’s Up with `Those Cheek Pouches? A hamster’s cheek is nothing like yours or mine. Their cheeks contain rather large pouches that extend all the way back, to their shoulders. To illustrate just how large a hamster’s cheek pouch is, consider the fact that a grown Syrian hamster can store an entire shelled peanut in one of their cheek pouches. This enables hamsters to carry around a lot of food discreetly and efficiently. In fact, hamsters have been known to carry more than just food in their cheek pouches. They may move some bedding this way if they are forming a nest. It is also not at all unheard of for a mother hamster to store her pups in these massive pouches. This, while it might sound unsettling, protects the pups from environmental dangers and allows the mother to move them as easily as she moves her food. These pouches, unlike human cheeks, contain no salivary glands. This means that in addition to keeping their food, babies or bedding material safe, they are also keeping it dry. A hamster can even eat while their cheeks are stuffed to the limit! 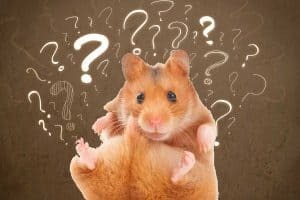 What Should a Hamster Owner Know About Cheek Pouches? A hamster’s cheeks might be the cutest thing about them in your eyes, but these pouches are unfortunately vulnerable to some not-very-cute problems. In most circumstances, you’re not very likely to run into tremendous problems relating to their cheeks. Still, it’s important to be aware of the problems that may arise in this sensitive and important area of a hamster’s anatomy. The information here is to help you become an informed hamster owner. Never try to diagnose or treat your hamster at home for any cheek-related issue! This is an extremely delicate organ in a small and tiny pet. Work with a good exotic pet veterinarian and never delay treatment if you suspect anything is wrong. Some of the treats and daily foods that hamsters enjoy can have sharp edges – like sunflower seeds, for example. If a piece of food were to cut the inside of the cheek, an abscess can form. Abscesses are localized infections, characterized by swelling and the presence of pus. The hamster’s cheek looks bulged, even when they aren’t storing food. The swelling on the hamster’s face is very firm, unlike when they are storing food. You can visibly see the pus-filled abscess when/if you get a chance to look into the hamster’s mouth. The hamster seems to eat less. Abscesses can be quite painful. Bringing your hamster to the vet is the only course of action to take if an abscess is suspected. Your veterinarian will craft a treatment plan and get your hammy back into food-storing order in no time! Read more about abscesses in hamsters. A hamster’s cheek pouch becomes impacted when they are, for some reason, unable to fully empty their cheeks of food. If a piece of food becomes lodged within the cheek pouch and the hamster cannot remove it themselves, infection is possible. This is because the food will, over time, rot inside of the hamster’s mouth. If your hamster seems to have had a filled cheek pouch for an extended period of time, it may be impacted. If addressed before infection takes place, the removal of the offending foodstuff can solve the problem in mere minutes when done by an experienced exotic animal vet. Read more about why all hamsters need good veterinary care. When the cheek pouch flips outward and out of the mouth, this is called eversion. This is very easy to spot, as you will see a small sliver of pink material (the cheek pouch itself) sticking out from the corner of your hamster’s mouth. This can only be addressed by a veterinarian. Oftentimes, the cheek pouch must be stitched back into place – and only a vet should try this. How Can I Avoid These Cheek Pouch Problems? Sometimes these things happen despite doing the very best by our hamsters. However, it is never a bad idea to act with precaution to minimize the risk of these occurrences happening to your hamster. Impaction is often caused by a hamster eating very soft foods. These foods, like bananas, are unlike a hamster’s typical fare and due to their soft texture are very difficult to remove from the cheek pouch. Other issues can be avoided by ensuring that your hamster only has access to safe things to chew on. Chewing is an important part of hamster wellness, as it files down the teeth to keep them at a safe and comfortable length. Too-long teeth can snag on the edges of a cheek pouch and even tear it. Make sure to provide high-quality chewing toys or treats, like untreated wood, for this purpose. 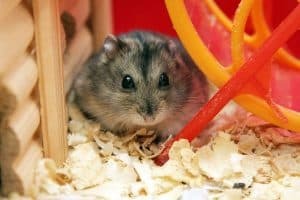 Sharp edges in the` cage, or even sharp edges of the cage itself, can cause these problems if the hamster has taken to chewing on them. Make sure that any broken plastic, like toys and tunnels, are discarded immediately. Damaged hamster cages should also be replaced, for this reason, and a slew of others. A hamster can store a lot of food for a very long time. This means that there is a strong possibility that you’ll find pieces of old food lying around their cage from time to time. Do your best to remove old and stale food from their cage when you see it. If you perform a deep and thorough cleaning of your hamster’s cage once a week, this might not be too big of a concern. Still, keep an eye out for this regardless. Stale food is unhealthy food! Should I Empty My Hamster’s Cheek Pouch for them? Never try to remove food from your hamster’s cheeks! If you suspect there may be an issue preventing your hamster from emptying his or her cheeks – get them to the vet. There is no good reason for a hamster owner to try and force the food from a hamster’s cheek pouches. You might feel compelled to do so if it seems like they’re holding an impossible amount of food, or if they’ve been holding onto the same food for a long time. But do not do it! A hamster will empty their cheek pouches on their terms if you give them enough time. 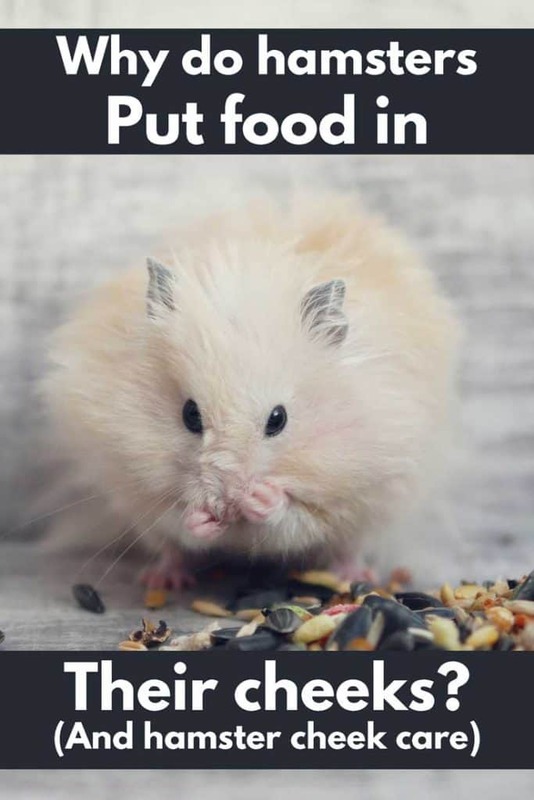 Forcibly trying to remove the food or trying to prompt them to do it on your timetable can stress out hamsters when there is nothing actually wrong. Some hamster owners have even caused damage to the cheek pouches this way, including bruising. You may worry, but trust that a hamster will do what nature has ingrained in them to do. Under most circumstances, they will successfully evacuate the food themselves. Human intervention in this process should only be performed by a qualified professional when impaction is suspected. If your hamster has gotten hold of something that they should be eating and shoved it into their cheek pouch, you probably have nothing to worry about. Hamsters cannot swallow food or any other item that’s being stored in their cheeks. They will spit it out, just like they spit out food when they’ve decided that it’s time. A hamster can carry up to 20% of their overall body weight in food when it’s stashed in their cheek pouches. Natural instincts drive them to do this, so don’t fret if your hammy’s cheeks seem like they’re filled with an impossible amount of food. While a hamster’s cheek pouch is both impressive and adorable, it can also become damaged or infected. 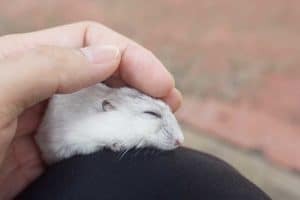 Hamster owners should know the signs of abscesses, impactions and eversions so that they can act quickly on their hamster’s behalf by taking them to a qualified veterinarian. This can save them from extensive health problems and even save their life. In short: Just enjoy your hamster’s crazy-cute antics, including the cheek-stuffing. It’s a funny sight to see when they’re walking around with gigantic cheeks that are full of food. It’s even more entertaining to watch them diligently empty their cheeks when they’ve decided it’s time to do so. This is perfectly normal and healthy behavior for all hamsters, so don’t stress. Your hamster’s simply channeling their wild roots and natural instincts.